Jack Perkins started in the sign business in 1973 as a sales representative with Lamar Dean Outdoor Advertising. He became executive Vice President of Naegle/Lamar Dean Outdoor Advertising in 1974. In 1977 Perkins started his own company, AdSign, working out of the basement of his own house. He and his wife handled it all: sales, fabrication, delivery and installation. In 1979 AdSign was incorporated. Perkins moved his growing sign business out of his basement and into a facility on North West Blvd. in 1980. Seven years later he opened a facility on Gun Club Road which is where the AdSign company is located today. 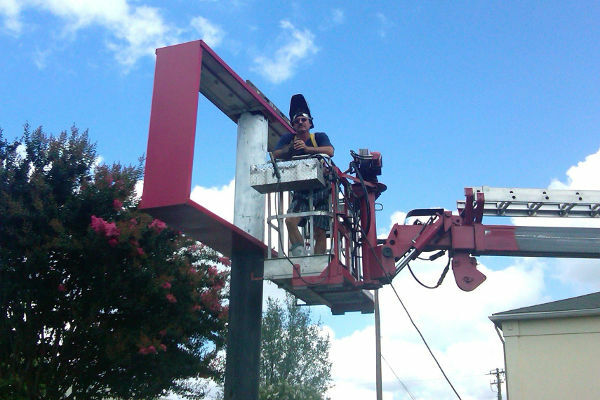 At that time he started full fabrication and installation of all electronic signs and billboards. Our sign fabrication facility is 30,000 square feet, and plays the lead role in AdSign being able to produce top quality signs. It all starts in the computer room, with graphic design. From there it is sent over to the production department where computer controlled routing brings it to life. Our manufacturers utilize high quality materials along with sign-making equipment to fabricate a creative one-of-a-kind sign for our customers. Our expert technicians make sure your sign is safely installed and that it creates a positive impression upon first sight. AdSign is proud to say that we handle any and all fabrication in our facility. AdSign is located next to I-40 on 7 acres of land, with a 30,000 square-foot manufacturing building.